Can you get everything you could want from any online casino? It looks like you can if you choose Reel Island Casino. They provide a mobile casino as well as the usual desktop version, and they’ve packed each with a stunning array of high-quality games. Let the fun commence! If you like online fruit machines, Arcade Bomb is a countdown to explosive wins! Make no mistake – this is an impressive casino. Some casinos overdo it with colour and changing images the moment you arrive, but not this one. Reelisland.com benefits from high-quality graphics in both the site itself and the games it provides. Imperium Network Solutions Limited, based in London, manages the Reel Island brand. The owner is Caddell Limited NV, and they are regulated by the UK Gambling Commission. While the desktop casino looks good and is very responsive, they have also created a mobile site. All you have to do is visit the usual URL and you’ll see the mobile version. This works fine on iOS devices and Android devices. The site is also designed to offer you free-play versions of the games without the need for logging in. That’s good if you’re undecided whether to join or not. Mind you, once you see what awaits you here, you probably won’t need any time to decide whether to join or not. Reel Island Casino offers up dozens of games, and it’s not just about slots either. You’ll have dozens of those, but it is also possible to enjoy casino games, bingo and even go to the live casino. Games featuring jackpots are also available to be viewed in their own dedicated section. You can see the jackpots clocking up in real-time as you see which games are available. New slots at Reel Island Casino in 2016 include the Jimi Hendrix slot, Witch Pickings, and Fantasini Master of Mystery. If you want to play something else, you can choose from American roulette, various forms of blackjack and Texas Hold ‘Em, among other games. Reel Island Casino has plenty of games to offer because it has linked up with lots of game providers. These include leading providers such as NetEnt and NextGen Gaming. Other names you may not be as familiar with include Elk Studios and Quickspin. However, with a dozen software providers granting access to their games at this casino, you’ll have a nice mix of games to choose from. 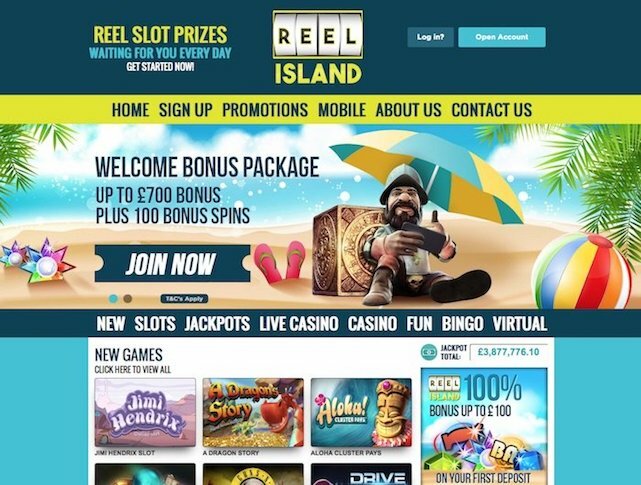 Reelisland.com may not be one of the most famous online casinos around, but they have a bigger array of games than some other casinos do. Once you see how smooth the site is to load and display, and how impressive and sharp the gameplay is in every respect, we think you’ll want to join. First and foremost, there is the live chat feature. This is quick and simple to use – it even tells you where you are in the queue to chat with someone. That’s not something we’ve seen before. You can also access a ‘contact us’ page by clicking the relevant link at the top of the site. You’ll find an email address here, along with FAQs and a trouble-shooting section. A series of logos at the bottom of the page reveal the banking methods that are available, too. These include Mastercard and Visa, while other methods such as Paysafecard and Neteller can also be used. The fun you can have on this site is clear. Access to free demo modes, a great welcome package and a great mobile site all combine to provide you with a superb gaming experience. The wide-ranging mix of games means there is something for everyone as well. To be honest, it is hard to find much wrong with this site. Of course, the proof is in the pudding, and when you join you’ll find out just how appealing it actually is. We doubt you will be disappointed though, as Reel Island knows how to reel you in.